A fresh oyster is an absolute delight, whether enjoyed on the half shell or prepared in a recipe like Oysters Rockefeller. 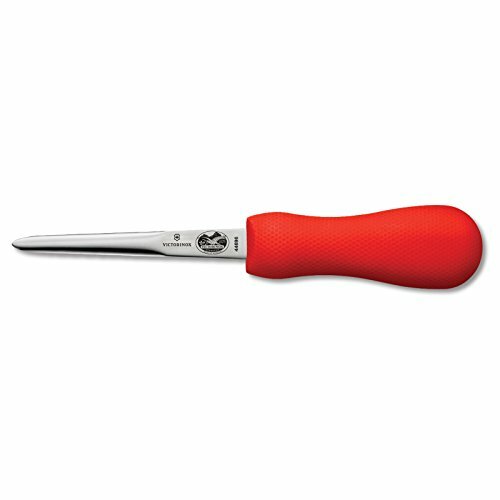 If you enjoy fresh oysters or clams on a regular basis, you need to invest in a quality knife that efficiently pries open the shell and cuts the muscle or membrane hinge to remove the meat from the shell. This is known as “shucking” an oyster. A well-designed knife which you become comfortable using can make all the difference in quickly preparing your oysters to enjoy fresh. 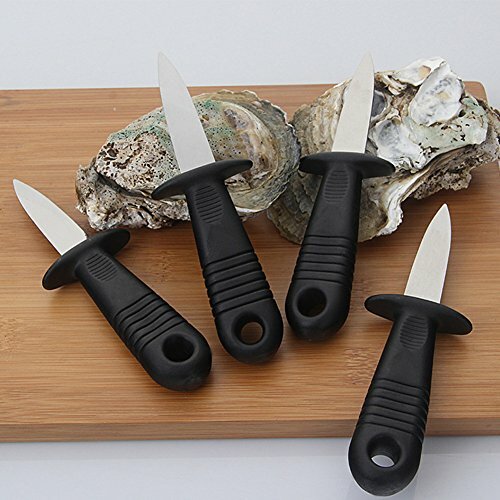 Oyster knives are relatively blunt compared to an ordinary kitchen knife but have other features that are important, like a short, beveled blade that can be inserted into the tightly closed shell with an end that can then cut through the muscle. So, let’s take a look at some different models to help you make the best choice. This knife features a pakkawood handle and a “full tang” blade made of 420-stainless steel. “Full tang” means the knife is one solid piece and the two handle pieces are attached – in the case of this knife, with three rivets – to the blade, one on each side. A full tang knife is the strongest of the tang types because its metal extends up to the end of the handle. Because this knife has a thick, high-carbon, stainless-steel blade that’s reinforced, it’s rigid and wide enough to slip between oyster shells. It feels light yet durable and is sturdy enough to handle large oysters but compact enough for small ones. The wood handle is a comfortable design and has a skid-free grip with a hand guard. The grip makes it possible to “shuck” even when your hands are wet, and the hand guard protects your hand if it does happen to slip while prying open the oysters or clams. This knife measures six and a half inches from end to end and has a two and a half inch blade. It’s also attractive looking and includes a leather holster for storing. This knife is a different style in several ways, from the shape of the blade to the handle material. The handle is made from post-consumer recycled plastic, with a thumbprint to help eliminate slippage. The blade is Japanese high-carbon stainless steel and is stain-free and rust-resistant. The blade also extends right to the end of the handle and is bent at the tip to allow you to pry into the shell and pop it open. The tip has sharp edges to cut the membrane to get the oyster out of the shell. If necessary, it can be tightened with an Allen wrench. Toadfish does say that is isn’t designed for the large Gulf Coast oyster, so that may be a factor in your decision. 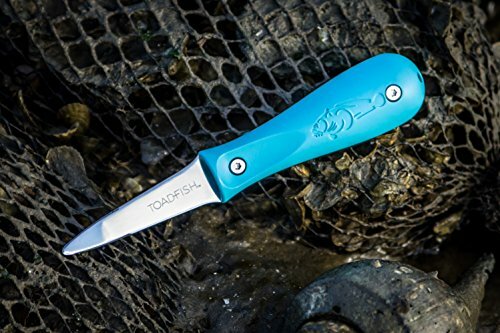 If sustainability is important to you, this knife handle is made from post-consumer recycled plastic, and Toadfish donates a portion of proceeds from all its products to oyster habitat restoration projects. Toadfish states that for every shucker sold, they plant 10-square-feet of new oyster habitat. 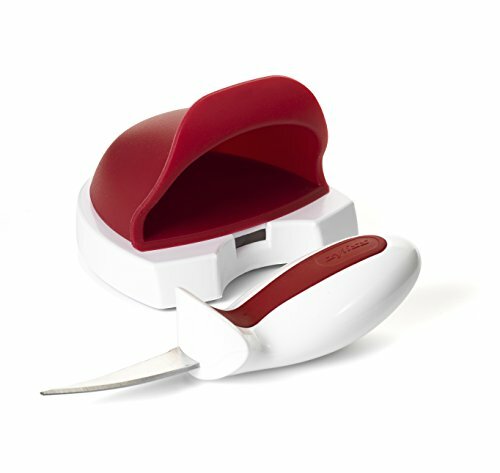 This product is unique in that it comes with an oyster holder that also stores the included knife. 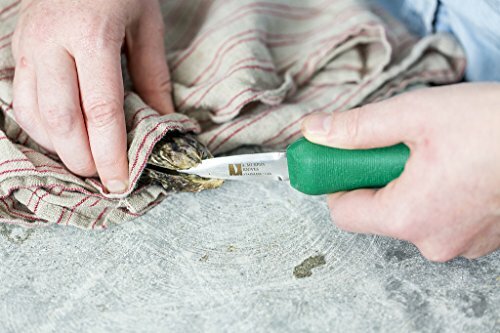 The oyster tool – or silicon oyster “pocket” – holds the oyster and keeps your hands safe while the knife pries the oyster open. The tool has non-slip feet and the knife features a non-slip handle and a stainless steel blade. Simply put the oyster in the pocket and pry it open with the knife. The pocket has the bonus of holding any oyster liquid that may come out during shucking so that you can collect and use it. The knife then slides into the bottom of the pocket for safe storage. All parts of this set are dishwasher safe. The only downside I can see in this product is trying to use it if the oysters you get are either too large or far too small for the pocket to hold properly while shucking. This knife’s claim to fame is that it was designed with the oystermen at Island Creek Oysters in Duxbury, Massachusetts. 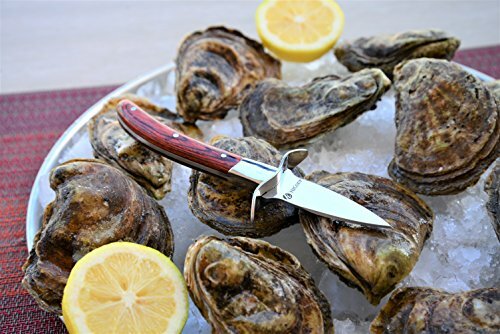 The blade is made of commercial-grade stainless steel (420 high carbon) with a tough, pointy tip that allows you to pry into the oyster with little force. The blade design is called a “New Haven Tip,” which is a bit shorter at about 2-1/8 inches long. The blade doesn’t flex but the end is slightly bent to make it easier to pry. The handle is ergonomically shaped and made with polypropylene plastic in a “Murphy Green” color, designed to be lightweight. It is recommended that this knife is washed by hand and not in the dishwasher. This knife is compact, sturdy, and dishwasher safe. It has a high carbon steel blade that is slightly bent at the tip, and a slip-resistant, hard plastic handle. This knife is designed in what is known as Boston style; it’s a bit longer at 4 inches, with an oval handle. Some shucking knives are named for the region where they are predominantly used, as they are designed to be best suited for the oysters of the area, bringing rise to the name “Boston” blade or “New Haven” blade. This oyster knife is made in the New Haven pattern as it has a short, wide blade with a convex, pointed tip that is slightly bent at the end. 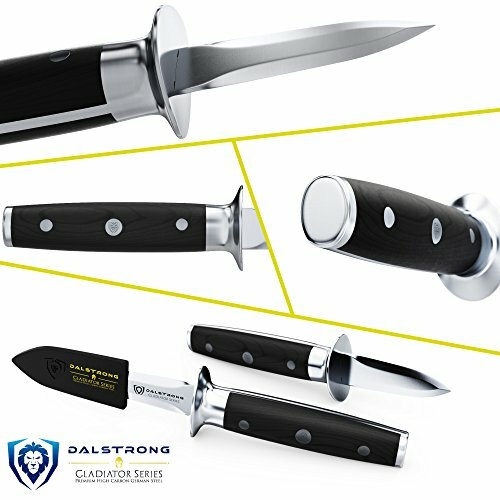 The blade is made of high-carbon, high-alloy and stain-free steel known as Dexsteel – Dexter’s proprietary make of steel. The handle is described as “sani-safe” and it’s a tough, hard plastic with a slight texture to provide a solid grip. It’s recommended that it be hand washed. The Nizzco has a stainless steel blade and a plastic handle and is one of the few plastic options that feature a hand guard to protect against slippage. The entire length of the knife is just less than 6 inches long and it is dishwasher safe. With this option, you get a set of four knives, so it’s ideal for “shucking” parties. You can invite guests over, order a bucket of oysters and let everyone shuck away! With this knife, we return to a full-tang, wood handled option with a hand guard. The blade itself is 2.75 inches long and quite thick, made of high-carbon ThyssenKrupp German steel. The blade is tapered with a pointed tip and the handle is quite long. That may be a preference compared to some of the smaller handled knives we have looked at. The blade is triple riveted to the handle, which is made of black pakkawood, laminated for extra water and stain resistance, as well as giving it a non-slip surface. It does have that wide handguard if your hand does happen to slip. It also comes with a sheath for storage. 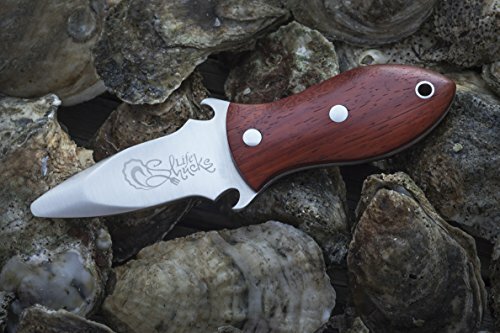 This knife brings out the fun, with “Life Shucks” engraved on the blade and a bottle opener built into the side of the blade. But it’s not all about fun, as it does feature a full-tang, stainless steel blade and a solid rosewood handle. The blade is rust and corrosion resistant, tapered at the end to pry into shells. Its full length is 7 ½ inches, making it one of the bigger options in a shucking knife. This shucker comes in a stylish gift box, so would be perfect to give as a gift. 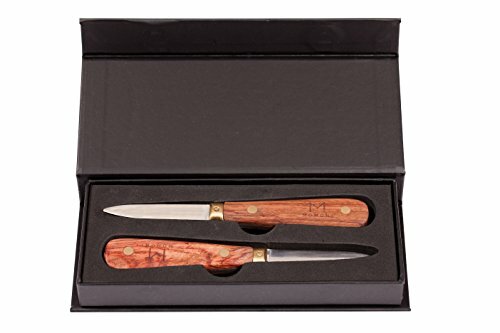 The Momoni set has two knives, packaged in a gift box, making it the perfect gift for the couple that likes to shuck together. The knives have stainless steel blades that are thin and tapered at the end. The handles are wood but with a non-slip surface. There are many excellent options here, so the final decision may come down to personal preference. If you prefer a larger sized knife with a bigger handle and a hand guard, then choose the HiCoup Oyster knife. Conversely, if you’re looking for a smaller size with a durable, plastic handle, choose the R. Murphy Duxbury Oyster knife. There are a couple of good options for either plastic or wooden handles, and if you’re looking for a knife to suit a particular type of oyster from a particular region, then you want to narrow it to that exact style. If supporting sustainability is right up your alley, choose Toadfish Oyster Knife. 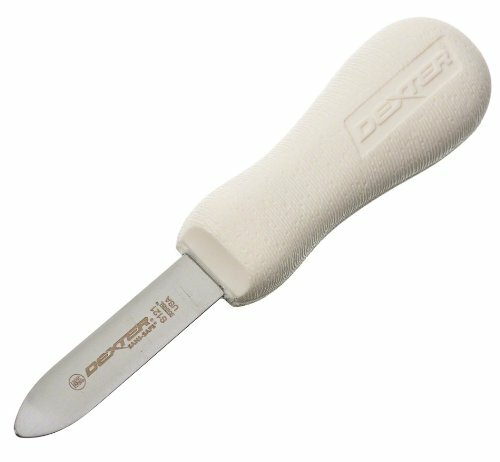 If it comes down to choosing one quality, solid shucking knife, then the Dexter-Russell New Haven style knife would be my top pick.